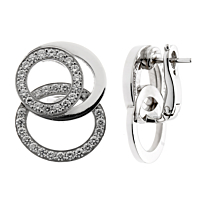 These Audemars Piguet diamond earrings are a timeless addition to any collection. Featuring the Millenary design cast in 18k white gold and adorned with the finest briiliant round cut diamonds, these earrings offer a touch of glamour to any outfit. The three white gold rings featured in this design create a dynamic yet classic look.